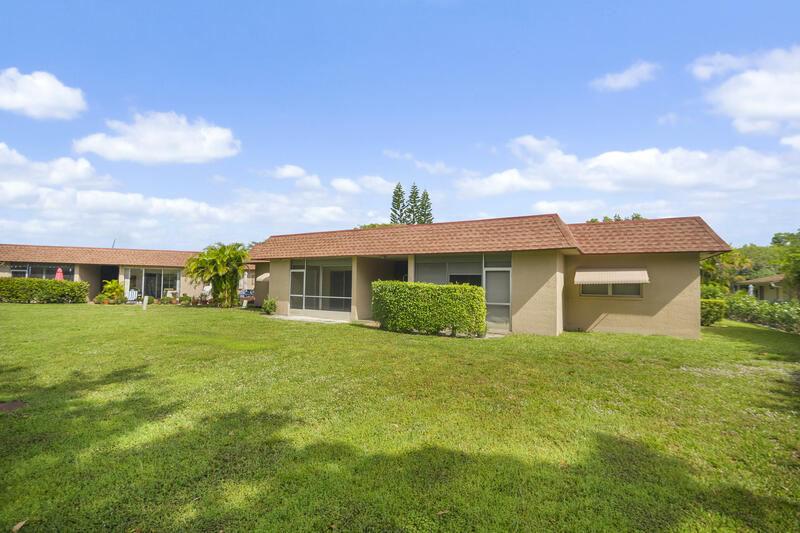 This spacious corner 2 bedroom, 2 bath unit with 1 car garage is located directly next to the clubhouse and pool in sought after Greentree Villas which has low association fees. With approximately 1400 square feet, this unit has a large master bedroom, kitchen with breakfast area, living room/dining area, and enclosed porch. The villa has accordion shutters and newer a/c unit (2015). Just minutes to 1-95 and turnpike, close to shopping and medical. Owners are relocating out of state. This home is located in GREENTREE VILLAS CONDO 55+ Active Adult Community. As an Active Adult Community Specialist for over 16 years, I know these communities very well. I am a real estate agent who cares. I don't just want to sell you a house, I want to sell you the perfect home that will fit your needs as well as your lifestyle. I live and play in an active adult community and the lifestyle is wonderful. Country Club living without the country club fees. To All of my baby boomers not quite 55 years old who want to live in a 55 plus community, please call me for a list of Active Adult Communities that will allow you to live in some of these wonderful communities! Please call me with any questions that you may have at (561)-306-7430.